2005 Custom Built Skiff by Busken Island Marine Class-Salt Water-Small Fishing Boat-Skiff-Flats Category-Fishing Boat, Jon Boat, Skiffs, Flats Year 2005 Make-Busken15 Length-15 Propulsion Type-Yamaha-25 2005 Yamaha 25 HP This 2005, 25 hp Yamaha is made for saltwater. This outboard engine weighs approximately 141 pounds. It has 2 cylinders. The pistons have a 30.3 displacement. The bore width is 2.56" and the stroke length is 2.95". This model has a recoil starter. Hull Material- Fiberglass, Closed Cell foam Amenities- Tiller Handle, Bench Seat W/nonskid, Short front deck with seat, Fishing Deck at Stern, Live Well, Bow hatch with commercial cover, Gas tank area with Commercial cover, Fishing rod holders, Trolling motor Bracket, Wiring for lights from bow to stern, Light accessories, Fiberglass Boat, 1inch of Closed Cell Foam in bottom for stiffness and floatation, Foam in closed compartments. I had this boat custom build for me by Joe Busken in 2005 at Gulf Shores, Al. This is a forever Boat -a once in a life time boat. This Skiff will take the test of time. This is a very low maintenance Boat. I have had past boats that cost me plenty to maintain -I had this boat built with this in mind. From Fiberglass construction to a small outboard motor - I wanted a simple boat. If you want to go fishing or boating without spending lots of cash this is your boat. Always kept under cover I truly love this boat. 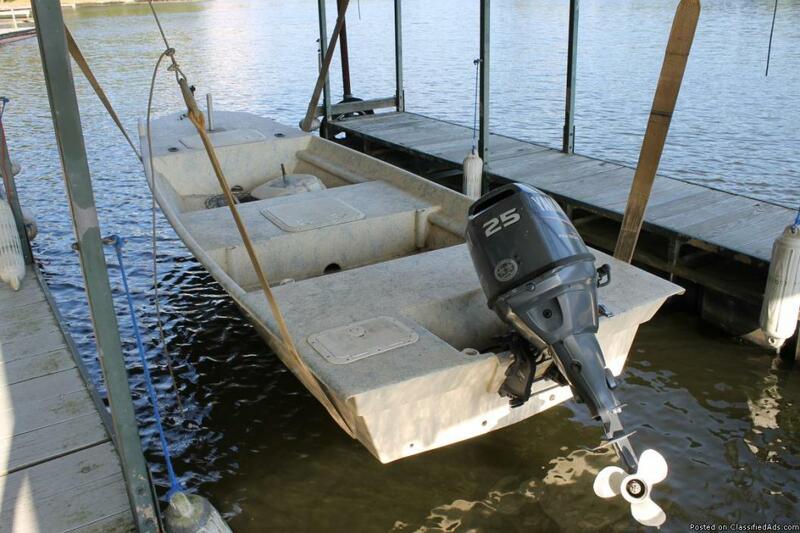 This 1989 Questar bass boat 150 Evinrude TP 150 runs good and is in good condition. It has good carpet, new tires, new trolling motor, and new seats! Listing for $3,800. INCLUDES TRAILER. Located in Magnet Cove AR. If interested please contact me at (501) 332-7120 or (501) 815-2310.